Dance Jewelry: Temple Jewelry - How do Artisans make it? 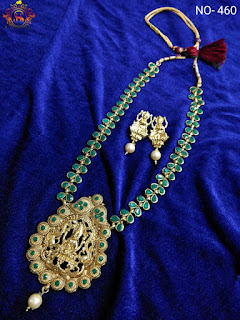 This blog is created and maintained by http://www.DanceCostumesAndJewelry.com The product updates and details of some of our services are described in this blogsite. Please comment and let us know what you think. Temple Jewelry - How do Artisans make it? Temple jewelry has been a part of south Indian tradition for centuries now. Ancient Tamil literature and its historical writings list many types of jewelry worn by idols, gods and goddesses. The art of jewelry making is known to have originated somewhere in the reign of Chola dynasty in the 9th century, and it was a celebrated form of art all the way through Pandya Dynasty and the Krishnadevaraya rule from the 9th century till the 16th century. This traditional jewelry or temple jewelry is made by using silver or gold as a base engraved and crafted to intricate designs with some precious stones embedded on them. 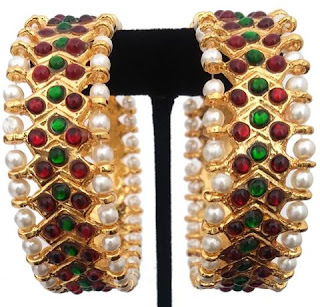 The embedded stones may be dark green or dark reddish maroon in color. Temple jewellery, an essential part of the adornment of the Tamil bride, is also an integral part of the aharya or costume of a Bharatanatyam or Kuchipudi dancer. Bharatanatyam is one of the classical dances in India which has its origin from religious rituals. Bharatanatyam is one of the oldest and most popular forms of classical in South India. Temple jewelry is important in the form of accessories to the costumes used in Bharatnatyam and Kuchipudi. The bharatnatyam dance jewelry sets are made with dark green & dark maroon –red, quality called kempu stones, also known as temple jewelry. The traditional temple kempu jewelry are the designs worn by Maharanis or Devadasis in the ancient times. Now days they have become fashionable to be worn for wedding, occasions and Indian dance forms like Bharatanatyam , and Kuchupudi. The stones are un-cut polished stones in red & green. Besides being a part of dance costumes and bridal adornment, the deities and idols are also heavily decorated with jewelry. The temple jewelry is made precisely by hands of traditionally trained artisans. Vadaserry, a tiny village on the outskirts of Nagarcoil is famous of the crafting of traditional temple jewelry. About 60 jewelry making units are working with each of them having about 350 artisans, trained in a traditional way. · A die of the required shape is made. It contains the engraving and minor detailing work that needs to be in the jewelry. These shapes and details may resemble the figures of deities, parrot, serpent, lotus, motifs, faces of gods and goddesses or any other of the sacred symbols. · A gold foil is mechanically worked on the die to give it the shape of the die, working takes place in cold conditions, and no excessive heating of the gold is required. Moreover a sheet of gold is used with relevant thickness. · After it has been shaped, the jewelry piece is embedded and embossed with the precious stones ‘kuchu kal’, the precious red or green stones. · Final step is giving it a nice surface finish, polishing and an antique finish. As the time has passed by the affordability and accessibility of temple jewelry has changed, the design of jewelry itself has evolved and modified. These days, silver metal is used as the base for the piece and is later plated with gold. The recreation of the antique gold jewelry has made it affordable for anyone who wants to feel like a part of traditions and cultures. The artisans of Vadaserry also export these pieces of ancient Indian heritage to America, Canada, London, Singapore and Malaysia. The crafting of the temple jewelry is more than just a way for employment and professionalism but also a way for the preservation of the art form for the next generations. Copyright by AstralComm LLC, Carmel, Indiana. Simple theme. Powered by Blogger.